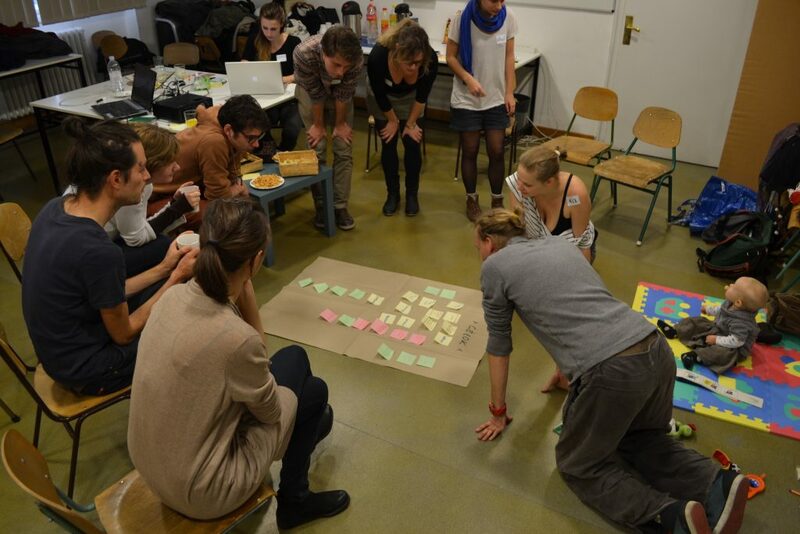 In 2011 a dozen young people retreated for a weekend to one of the suburbs of Hungary’s capital to discuss the alternatives of individual home-ownership, and to sketch the contours of a possible model of co-housing. In 2011 a dozen young people retreated for a weekend to one of the suburbs of Hungary’s capital to discuss the alternatives of individual home-ownership, and to sketch the contours of a possible model of co-housing. The group was coagulated from students and young intellectuals connected through several civic and political projects, and used a spacious collectively rented ran-down flat in downtown Budapest for their meetings – and some of them for living. One of the outputs of this discussion was a blog post entitled „Why do you need 30 washing machines in a condominium?”. Through this metaphor it emphasised the potential advantages of collective forms of living: resources can be shared, and a collective control can be exercised over the residents’ most immediate habitat. The post catalysed a rather emotional debate online, and the initiators continued to organise meetings around this topic. They formed an informal group named after the street where their collective rented flat was situated: Rákóczi Collective (RC). In the coming years they organised five different collectively rented flats, where altogether 28 people lived for shorter or longer terms, producing a system of rules and rituals that organised cohabitation according to the principles of collective optimalisation of shared resources. All of the authors of this article became members of this Collective, and residents of these flats in the recent years. In the following we will focus on the last two years, when the almost dozen members of RC decided to reorganise its institutions in order to establish the first co-operatively owned collective housing project in Hungary. The aim of this article is twofold. First, we will present an auto-reflexive, auto-ethnographic analysis of Rákóczi Collective. The story of our collective is not (yet) a success story: after a few attempts to realise a cooperatively owned co-housing we faced various obstacles. The second aim of the article is to argue that in our understanding these obstacles are above anything else structural, and rooted in the structural position of Hungary on the periphery of Europe. Thus while the Western European examples are indeed inspirational, they do not offer us clear-cut solutions for the obstacles that are encoded in the institutional landscape where we have to work. As a result, we argue against those discourses that would explain the success of Western European groups and the lack of existing groups in Eastern Europe as an essentially cultural phenomenon (cf. “the lack of organisational experience”, “the lack of professionality”, “different attitudes”, etc.). In order to understand the story of RC, first of all we briefly introduce the ownership structure of the housing system in Hungary and in Budapest. Due to the privatization process happening under severe lack of capital by local governments in the early 1990’s, among other post-socialist countries Hungary is also famous for its high rates of owner occupancy. In 2016 98% of the Hungarian flats were privately owned, and 90% of them were occupied by its owner. Only 8,3% of the flats were rented, including the 1,3% owned by municipalities. In Budapest 5% of the flats were owned by municipalities (most of these are rentals), and the private rentals were 10,5% in 2015. Thus even in the capital almost 85% of the flats are owner occupied. In recent years both housing prices and rents increased rapidly: from 2014 in Budapest both of them doubled. This process makes it harder and harder for poor people and for young people to access housing either through acquisition or through rental. Moreover, territorial disparities are huge, with “regional ghettoization” in the making, which leads to increasing segregation. The rate of spatial mobility in the country is very low, thus people have a low chance to adapt to economic restructuring and to move where they could find jobs more easily. Public rentals could mitigate these tensions, but in Hungary the vast majority of public housing is owned by local municipalities, and given the decentralized and underfinanced local governmental systems they try to get rid of their remaining stocks. Most of these public rentals are in very bad condition due to systematic undermaintenance, and it is extremely hard to get access even to these decaying housing units. The private rental sector is similarly dysfunctional in terms of helping poor and young people. The legal regulation of private rentals is very weak, which makes the tenants extremely exposed to the (good or bad) will of their landlords. Market prices are not regulated, and the tax system pushes many landlords to the grey and black market, which makes the tenants even more vulnerable. It is not an exaggeration to claim that Hungary has an unfolding housing crisis since the 1980s. A historical perspective is also essential to get to grips with Hungary’s housing crisis. Since 1989 housing policy has had a very low priority in governmental policies (compared to its political importance during the one-party socialist regime, when for example between 1960-1975 one million new flats were constructed). Since the 1980s the few public subsidies that were targeted towards housing systematically supported private ownership and prioritized the more well-off citizens. The most dramatic among these policies – in terms of its detrimental social effects – was the introduction of mortgages denominated in foreign currencies in the 2000s: after the 2008 global crisis hundreds of thousands of people had to face an exponential increase in their downpayments as a result of shifting exchange rates between Hungarian Forints and foreign currencies (mostly Swiss Franc), as well as due to variable interest rates. The current housing situation in Hungary is disadvantageous for many social groups, from which we would like to highlight two. The most obvious “losers” are the poor. They either buy very cheaply in (mostly rural) segregated areas, where jobs and services are very scarce, or they try to enter the rental market. But public rentals are not accessible, while private rentals are very insecure and also quite expensive. In this context informal arrangements (housing related usury, illegal building, or other precarious solutions in their kinship networks) are mushrooming. The other obviously disadvantaged group is that of young people. Without having family background capable of financial support, there is no chance for the like of us to get into decent homes. An average rent for a one room flat in the inner city of Budapest would take 80% of the median wage, and 60-70% of the wage of an assistant professor. As all the members of RC are young intellectuals, it these data explain why we had to think about alternatives to typical housing arrangements. While our sociological position was one of the main motivations to form RC, there was another important source of inspiration. Many of the members of RC (and the residents in our rented flats) were members during their university studies of the College for Advanced Studies in Social Theory (Társadalomelméleti Kollégium, TEK). Colleges are special institutions in the Hungarian system of higher education: they are self-organized student organizations usually revolving around a specific discipline. In the case of TEK this has been critical social theory. The members of the colleges provide extra-curricular professional activities both for their members and for the wider public, and in the case of TEK this was coupled with the experience of collective living, and with a strong tradition of autonomous organizing. As TEK is affiliated institutionally to the Corvinus University of Budapest, it has a space in one of the downtown dormitories of Corvinus. Members of TEK have the possibility to live, cook and work there together. As members graduate from TEK, some of them wish to continue a collective way of everyday living – for many of us this was channeled into the activities of RC. Finally, the civic and social activities members were involved in parallel to establishing RC were connected to a new wave of left politics in Hungary, and the values connected to RC resonated with those politics. What RC pursues is the mixture of two objectives. One is collective living in a form of co-housing, the other is to have some collective form of ownership (possibly in the form of a co-operative). We are aware that these two things (co-housing and co-operative ownership) could be treated separately (as our recent, more pragmatic endeavors described in the last section show), but at the moment we would like to achieve both. Beyond the aim to secure our own housing situation in a different way than those available on the Hungarian housing market, we are also politically motivated. We strongly believe that creating commons – especially in the highly sensitive domain of housing – that are outside of the realms of pure market processes contributes to a better and more just society. Thus we imagine the first future materialization of RC as case out of which a model could be built that is accessible for a more diverse group of people than our group. What have we done to achieve our aims so far? In 2015 the members of RC decided to start a systematic process of organizing in this direction. We created working groups focusing on legal, financial, international and real estate related issues, and we formed partnerships with other organizations. We allied with a group of young architects aiming to popularize co-housing models in Hungary (Community Living initiative), we worked together with the most important Hungarian think-tank in the field of urban studies (Metropolitan Research Institute) and we contacted Western European groups (like the German Mietshäuser Syndikat, a network of more than one hundred German co-housing groups). In the following we will highlight some essential points reflecting on the issue of ownership based on the experience of the past two years’ intensive work. In the next section we will highlight those structural (institutional, financial, etc.) obstacles that a group like ours has to face in the post-socialist periphery of Europe. After that we will focus on the different possible options that could potentially overcome (some of) these obstacles. Here we will present our first hand experiences from the field, shedding light on municipal and entrepreneurial reactions to our proposals. Finally we will conclude with a discussion about how we plan to address structural difficulties in the future. The housing model we aim to establish is one where the building giving home to the community housing project is undividedly owned by a housing cooperative. The inhabitants would not have individual ownership rights, and their tenure status would practically be a long-term stable rental (ideally all inhabitants also being members of the legal entity of the housing cooperative). In the model we have developed, individuals’ only obligations in exchange for living in the housing cooperative would be to pay monthly rents and to participate in the collective processes of managing the building and its everyday life. Ownership rights would belong to the legal entity of the housing cooperative, which would also secure the finances necessary for the acquisition of the property. The capital of the cooperative would be constituted by bank loans and private loans. The latter can be given to the cooperative by members or outside supporters, and a certain interest is paid by the cooperative in a mutually accepted time span. The tenants pay monthly rent to the cooperative that covers monthly repayments and costs of the bank and private loans. If the loans are paid back, the members decide on a rent fee, from which maintenance costs and investments to further housing projects can be covered. The value of this model is primarily its accessibility and flexibility from the point of view of the inhabitants: they do not need to own capital or go into debt individually to become a member of the cooperative, and if life situations change, it is also easy to move out, since no initial financial contribution was made and there is nothing to be repaid. Furthermore, this is the model that would make it possible to overcome the burden of individually assumed risk inherent to individual private ownership. The risk we aim to overcome is mainly that of significant individual indebtedness – which is a precondition for obtaining private property for the majority of Hungarian society. Beside avoiding individual indebtedness, we believe that such an ownership model would overcome one of the fundamental constraints of the Hungarian housing system: notably that the only way of securing safe, stable housing conditions is through acquiring private property, driving to a high form of inflexibility for later decisions. We believe that the trope that all Hungarians “culturally prefer” individual private homeownership is entirely misleading, and is a consequence of the fact that most people don’t have any other option to house themselves or to have the possibility for long-term housing stability (not even mentioning that the mortgage crisis of recent years has shown how this stability is illusionary). However, as we take steps towards the concrete realization of this cooperative ownership model, we continuously encounter structural difficulties, mainly in terms of available financial resources for such a project. If we think of a model where the housing cooperative obtains ownership rights (which we see as politically important in order to withdraw the property from the market and to guarantee real self-management), a larger capital investment is inevitable. The most important issue we face is the potential source of this larger investment. The “cleanest” solution would be to obtain resources from a financial institution. Other options would include some sort of crowdfunding/ attracting many small investors, setting capital-requirements to entering members, or finding a large investor. All of the latter solutions require much more work and organizational capacities, and create individual situations for each housing project, which is not easy to reproduce. In countries where the stock of cooperative housing is significant, there is usually a way to secure larger funding in one sum, which can then be managed by the cooperative. In the following section we explore why such a larger, institutional source of funding has so far proven to be unavailable in our context. After this (in the last section) we will describe some other “assemblage” financing structures we see as possible options in this situation. First of all, there is no actor present on the Hungarian housing market which would have experience in providing finances for long-term rental housing. Even if we leave aside the political project of a collectively managed living space, and for a moment consider a housing cooperative merely as an institution providing rental housing: there is no experience in Hungary with institutionally managed rental housing (most rental housing belongs to small individual investors owning a few units). This means that financial resources are available for A) individual ownership through individual mortgages; or B) for construction-for-sale. The latter funds are available to companies on a short term – since they are calibrated for a relatively short turnover; with new housing units being sold relatively quickly after construction. This structure of available funds means that for larger economic actors of the housing market it is not worthwhile to invest in rental housing even on a market basis – since they would have to accept returns on a longer period of 15-20 years instead of 2-3 years (which they can generate if they develop for immediate sale). If we think of rental housing in a non-commercial, not-for-profit structure, returns would obviously be even lower and slower. Long-term, cheap funding is unavailable on the Hungarian housing market. This means that credit channeled into housing is systematically more expensive and is issued under less favorable conditions than in “core” economies. This is largely a consequence of the structural position Hungary takes up in the global and European economy. On (semi)peripheral markets, which are considered to be more risky and where governments often have a weaker bargaining capacity, economic actors expect higher and faster returns. In terms of housing finance this means that in Hungary they are not willing to give cheap credit (with under 5% interest rate) for a 20 year period as they would, for example, in Germany. This kind of long-term, cheap resources for housing finance are only available in places that are seen as stable housing markets and where financial actors have an incentive to park their money for a long time even if it does not generate important profits. The German or Swiss housing market is such a “safe haven”, while Central and Eastern European (and Southern European!) housing markets are rather the terrain for venture capital and high profitability. This is rather bad news from the perspective of a potential housing cooperative, where affordability is an important aim. Thus, the potential answer could be not to expect significant resources from a market-based mechanism such as bank credit. This would, however, require alternative sources to be available, such as government support or significant individual savings. In most places where cooperative housing models can easily develop, some kind of political support exists: ideally financial, but at least institutional and legal support. We are lacking this kind of framework – on the contrary; Hungarian housing politics (as developed in the previous section) are entirely geared towards promoting individual homeownership and are based on the conservative ideology of a nuclear family. The bottom-line is thus that either market-based or public financing mechanisms that could be used specifically for the establishment of a housing cooperative are apparently currently not available in Hungary (although we hope that our work will make such mechanisms available in the future). This means, however, that different kinds of compromises must be made and more creativity is required in the process of establishing a housing cooperative. In the following section we will briefly present other models for financing and ownership that we have explored. The question is always what compromise we are willing to make in terms of ownership and risk assumption compared to the ideal type structure we have originally envisioned. RC has been experimenting with several solutions, which can overcome the structural constraints and the lack of institutional support described above. The collective (1) negotiated with different state actors to acquire long term renting opportunities of public properties, we (2) tried to persuade private actors to invest in such a project, and (3) through negotiations with financial institutions, we developed an alternative in which case the cooperative is the owner of the property, while individual members either get indebted or invest capital in the project. The following dilemmas and constraints came up during negotiations with private and public actors. The first and second models are scenarios of long-term rental (from a public actor or from a private investor). This is currently an attractive option for us because it would allow for the materialization of the project without the need to attract significant amounts of capital – which at the moment seems to be the most important obstacle. In a rented building we could develop our model of functioning, and focus on institutional and community development, instead of having the huge burden of a debt and the pressure to constantly generate a significant cash flow to be able to repay it. The important compromise in this case is that we would be dependent on the owner of the property. So far we have not managed to negotiate a setup which would be favorable for us, typically because external actors are not willing to take the risk of the project. The third model is a scenario where we could buy ta house collectively – but due to the important constraints in how we can mobilize capital for this, risk would have to be assumed individually by certain members, and financial liability would be unequally distributed. RC has been in contact with several municipalities of the districts of Budapest, and also tried to develop a solution where the unified municipality of the city provides the property for the project. While in the first case several mayors and administrative staff showed interest towards cooperative housing, in the case of the municipality of the city the negotiations at this point arrived to a dead end. The municipality of the capital owns several empty houses. In the early 2010’s cultural and social services, like schools, dormitories or worker hostels were centralized in the hand of the city, while as a result of austerity politics those services did not continue to operate anymore. The initial idea of RC was that we approach the institutions which handle such a property and provide a solution where RC rents and refurbishes the property on a long term. According to the property management law there is an opportunity that an investor or any private actor can rent after an open competition such properties for a 15+5 years term, however in the case of the municipality of Budapest we encountered several constraints which limits the space of manoeuvre of the administration, and consequently the realization of such a project. First, the legal status of those properties limits the usage of them. The utilization of those houses is limited, since the original function (educational, catering, office etc.) limits for what purpose they can be rented. Second, since the distribution of labor related to handling the properties is prescribed in line with their utilization, changing the legal status of the properties implies that different state institutions would handle the administrative procedure of renting. That process of changing the legal status and changing the state actor RC is negotiating with implies that a political actor on a higher level of hierarchy needs to supervise the project, providing political support in the same time. Consequently, to be able to rent from the capital one needs to acquire political help, which oversees the whole procedure from the start. At a closer look at the contemporary transformation of the Hungarian state, we see a building up of a clientele system, where political deals are closely related to party and class politics.. The dependence from the l good-will of political actors thatsuch a process would have constituted, and the fact that it would have made it visible on the level of the mayor’s office of Budapest would have risked the sustainability of the project. Consequently after half a year of negotiations we did not continue experimenting in that direction. While city levelpolitics aretoo much bounded to the national level of political negotiations, the district level administration and politics havea relative autonomy in relation to that. During the last year RC approached several district municipalities, asking if they would host such a project by providing properties from their portfolio. While rent based housing targeting young people is present in the contemporary policy ideas of municipalities , it is based on the idea that cheap temporary housing should be provided to the youth between they leave the a family house and get to own their permanent home. It exclusively targets middle class young couples, based on the idea of homeownership as a basis for a nuclear family. It is imagined that as people achieve the rise of salary or capability of getting loans in their careers, these young couples would move out. During the negotiations with several municipalities, the RC project was pushed towards the samedirection, our interlocutors highlighting conservative ideas of the ideal living space such asowning being inscribed in human nature, or sharing as a source of conflict. Apart from these conceptual misunderstandings, which can be overcome during negotiations and long term partnership, we encountered several structural constraints. The capital for the refurbishment of the property can be raised only from bank loans, however because the collective is not the owner of the property the municipality would need to be the guarantor of the mortgage. However, because of the former indebtedness of the municipalities and the lack of working models similar to our project, they are reluctant to provide a mortgage guarantee for us. Oura housing project is also competing for the empty buildings with the boom of alternative schools. With the centralization and uniformization of education and the restructuration of education towards vocational training to serve industries relocating from core European countries, Hungarian elites and middle classes are increasingly enrolling their children in private schools. That market is also utilizing abandoned municipality owned properties. Another alternative model of financing, that we have explored in the case of a smaller house that was put up for sale by a private individual, was that of cooperating with one bigger investor who would buy the property with an agreement with RC for long-term rental. This scenario would have worked well with several basic principles of the Collective, without having to mobilize capital for the acquisition ourselves (we would have only payed the costs of renovation). However, potential investors would have either required high returns on their investment, which potentially endangered the affordability of the project, or – more importantly – considered it to be a too risky investment. The latter point is especially interesting and seemed counterintuitive for us, since the housing cooperative would provide a steady stream of revenue, while taking management costs over from the owner. However, investors saw it as a „non-existing product” on the Hungarian housing market which would be difficult to sell in case our project defaults. A property developed for the purposes of a housing cooperative (especially in this case which would have been architecturally designed in a quite integrated way) would be too costly to reconvert into individual flats (which could then be sold with higher certainty). The process of negotiating for a specific property in one of the well-off residential areas of Budapest showed how extremely spatially selective housing-related investment is in Hungary. Even though this area is highly priced and very popular among individual households for acquiring property, it seemed risky from an investment perspective, because it wasn’t in the small prime downtown area. This very high level of risk-aversion is characteristic to smaller, individual investors. We believe that if larger, institutional owners could be mobilized in favor of such a project, then this model could be feasible. However, in the case of a larger owner our vulnerability would also increase. Another potential obstacle in this model is the fact that while alternative forms of investment with much faster returns exist for those interested in investing in the housing market (such as buying individual flats for touristic or regular rental), a certain ideological commitment or personal engagement/ interest would probably be necessary. This is not impossible, but narrows the circle of potential investors. Our main „advantage” compared to these other forms of housing-related investment is that we would provide a stream of revenue that is calculable in the long term and would assume management tasks. During the negotiations with financial institutes we found that banks are reluctant to give loans for cooperatives. Here, our interlocutors argued that it is not clear how the financial responsibility is divided. They provided RC two options. Either an ltd. applies for an investment loan, in which case the interest rates are higher, or several members get individual loans and became co-debtors. While in the former case the level of the interest rate risks the sustainability of the project, the former implies several operational problems. RC recruits from a young middle class politically engaged circle of people, who are either incapable to buy property, or are unwilling to because of ideological reasons or involvement in small flat-ownership/ family inheritance.In the case of buying a house, only a handful of people would be capable to mobilize capital.he ones who had free floating money ready to invest such a project, and the ones who were good debtors from the perspective of the financial institutions mostly overlapped. This situation produces two structural problems. Firstly, it constitutes status differences within the cooperative rooted in the different risks people take in the project. If the people who are debtors and investors overlap, the attachment to the project by the risk they take constrain their mobility. That situation also overwrites the idea of horizontal decision making, since the ones who are more engaged materially demand bigger share in decision making. In that case the status differences between tenants and investors/debtors can be diminished only in long term, where parallel to the disappearance of mortgage the statuses can be slowly changed from a classic real estate-tenant relationship to membership in the cooperative. One of the conclusions we drew from our experience was that we cannot copy-past Western examples for our cooperative project. The difference in the banking sector, especially in the evaluation of risk in loans, and the lack of state subsidies constitutes a significantly different structural environment, and pushes us to invent solutions different from our co-operative allies in Western Europe. In the case of Mietshäuser Syndikat, the formation of the network was tied to the boom of housing cooperatives in Germany, the liberation of capital accumulated by the middle class during the trentes glorieuses by inheritance. It was also supported by the availability of cheap loans, and the squat movement as an organizational and political basis. Compared to such examples, we are convinced that our difficulties follow from a structural, and not from a cultural problem. We are aware of endeavors to realize cooperative living in Hungary from the early 20th century. Socialism symbolically brought housing under common ownership, however it in fact created a quasi ownership system focused on the norm of the nuclear family. After the privatization of socialist housing, a process dynamized not only by political considerations in favor of a market society, but also by the severe lack of funding of local governments, the dominant form of housing remained individual ownership. Within those conditions, however, we believe that today we face a structural push towards projects like ours. The housing crisis and the crisis of capital conversion pushes the young middle class towards renting, but that is an unstable and increasingly unsustainable solution. In contrast to that, cooperative housing provides a stable housing solution, and through institutions of reciprocity it is complemented by informal strategies of subsistence. Currently, there is a new boom of mortgages, which are only accessible to much narrower segments of Hungarian society than previously, as a consequence of regulatory and market responses to the large wave of defaulting mortgages after the crisis. This means that there are more and more people who fall out of the individual indebtedness-based model of homeownership, which is the only housing model promoted by the current government, too. These people do not disappear, and neither does the capital looking for alternative channels into the housing market. Thus, new forms of housing ownership, tenure and finance will necessarily develop in the coming period. The question is whether these new forms will only be market-based and exploitative, or there is also the possibility of developing new progressive models in the cracks that are opening. Budapest, Community , community, cooperative, economy, finance, Funding the Cooperative City, housing, ownership, renovation.